Focus: This month’s theme gives Pack’s the impetus to finally pick up the BSA Crime Prevention Program as a regular activity (if they haven’t done so already). It’s mid February 2002 as I write this, and just down the road from us we have seen a rash of car thefts that has just led to the unintended death of a young lady as she was asleep in her apartment. We need to emphasize to our children the importance of following safety rules and being good, responsible citizens. This month’s theme gives us an opportunity. Our baby, okay she’s 17 years old, got accepted at Auburn University this past week-end. Auburn is in Alabama, about 3 hours away from here. I still haven’t gotten a new car, but almost. I am getting a 2003 Highlander which is due in port today probably down in Florida. This Thursday I am going to Sandestin, Florida through Sunday for a business convention. Looks like my darling husband will be picking up my car for me and putting those first miles on it. And that’s okay. In last month’s issue of the Bugle a mistake was caught by Marcia a Cub Scouter who reads Baloo. In the Webelos Citizenship section there is a reference to BSA Skill awards which are no longer used in the BSA program. You are correct that each rank in Cub Scouts and Boy Scouts has a Citizenship element; even the Tiger program about their community continues the citizenship theme. 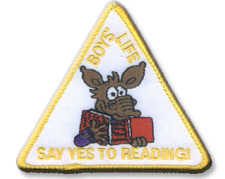 Enter the 15th Annual Boys' Life Reading Contest Now! The top three winners from each age group will also get a Leatherman multi-tool (or any two books they want), copies of Codemaster books 1 and 2, the limited edition Codemaster pin-and-patch set—plus their names announced in Boys' Life! The contest is open to all Boys' Life readers. Be sure to include your name, address, age and grade in school on the entry. Entries must be postmarked by Dec. 31, 2002. New Religious Emblems Video Available From P.R.A.Y. Joan Walker 1-800-933-7729 joanw@praypub.org (St. Louis, Mo.) - Programs of Religious Activities with youth (P.R.A.Y.) is working with the BSA National Relationships Division in distributing the new religious emblems video entitled, Promoting Duty to God (Religious Emblems), No. 05-883. Although the Relationships Division will provide two videos to every council this fall, additional videos will be available from P.R.A.Y. Videos may be downloaded from the P.R.A.Y. web site at www.praypub.org or they may be purchased at a price of $6.00. The religious emblems video is an interfaith resource promoting the religious emblems of ALL faiths. It is 7½ minutes long and is designed to be used in council and district training events and in presentations to individual units. Also available from P.R.A.Y. are several resources to be used in conjunction with this new video. These resources are available at www.praypub.org.